Looking for Package Deals to Sedona? We have those too! People ask, “Is there no end to Sedona's spectacular sights, as well as the availability of its spirited outdoor activities?”. Certainly there is no end for the curious residents and visitors who seek the unique, private enjoyment of the canyons, creeks, mountains and forests that dot this beautiful land. All that is needed to tap into its natural pleasures is the ability to sense its splendor and the ambition to accept its inviting challenges. If you're a golf buff, tee it up at highly rated championship courses open to the public, but don't get more concerned about taking shots with your camera than your clubs. This is premier Sedona country club is always open to the public! 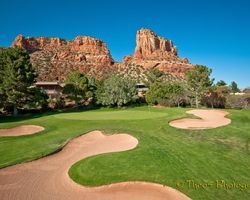 Oakcreek Country Club was designed the infamous father-son duo of Robert Trent Jones Sr. and Robert Trent Jones Jr., as Sedona's first golf course. It is an 18-hole championship course nestled in the majestic Sedona red rocks with views beyond compare... Truly a masterpiece. 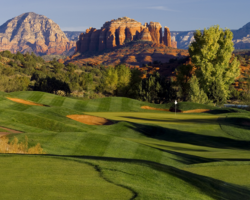 This Sedona, Arizona golf course has a traditional layout similar to those that you may find in the midwestern US. In the usual Trent Jones manner, the fairways are classic tree lined doglegs with fairway bunkers strategically placed in the landing areas and greens which are all slightly elevated and surrounded with large swirling greenside bunkers. The golf course is "player friendly", allowing plenty of room for error but always with an opportunity to recover and get errant shots back into play. Robert Trent Jones Sr. said of the course, "Every hole must be a hard par and an easy bogey". Come experience one of Arizona's true golfing treasures.